Has anyone attended an AAPC ICD-10 Bootcamp? The website talks about what materials they will provide to you during class, but I'm wondering what materials anyone took with them (ICD-9/CPT books, etc) and found useful, didn't need them, etc? Thank you! I attended the Bootcamp and only took a notebook, pen and hi-liter. 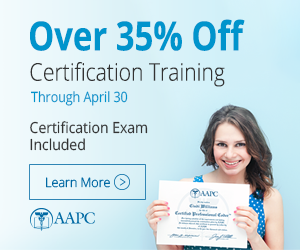 The AAPC provides you with the materials that you will cover. I attended the 2 day seminar in July. I found it to be an excellent source of information. They provided 2 spiral notebooks (one for each day) that included templates, flow charts,and key points of ICD 10. We were also given a draft copay of ICD 10, which is so great to have. It is really an in depth seminar. I suggest it to anyone who is involved in the ICD 10 transition. really worth the money!! Just attended this seminar, first day only -- dealing with diagnosis coding. I took sticky notepad, highlighter & pens. I received an excellent spiral bound workbook of the coding guidelines and some exercises, as well as a draft copy of the ICD-10-CM manual. Since we have several coders here, I didn't want to write in the workbook, so the sticky notes came in handy! If you are at all anxious about this major change, the exercises will help you put it in perspective -- after all, coders deal with changes every year! Another good idea the presenter mentioned: take a few of your reports each month, & recode them using ICD-10, and you'll have an idea of the time & effort involved plus you'll be getting used to the system. Good Luck all! Is the Boot Camp enough preparation for the certification for ICD10?